​In news that everybody knows already, Los Angeles Angels star outfielder Mike Trout is a classy dude. 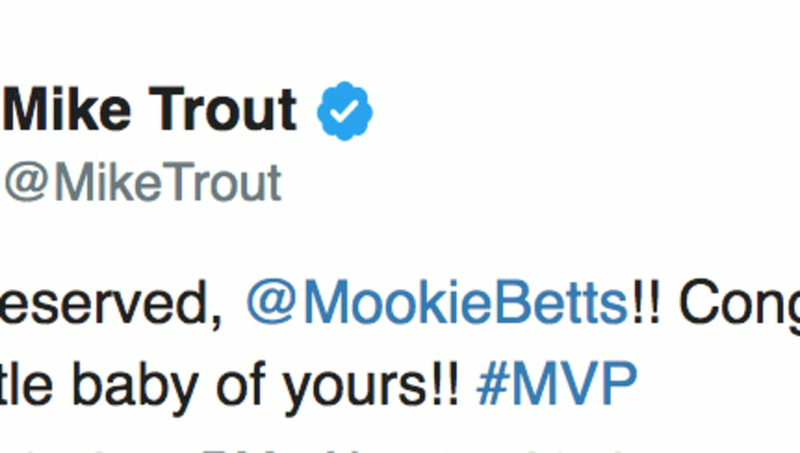 After losing out on the American League Most Valuable Player award to Boston Red Sox star outfielder Mookie Betts, ​Trout took to his personal Twitter account to congratulate Betts on not only winning the prestigious award, but for his newborn baby as well. It's actually impossible not to love Trout. The guy is as humble and classy as they come. We all know that Trout is the best overall player in baseball, given his two MVP awards, but instead of being cocky and complaining, he let somebody else have the limelight for once. That's just something you don't see all too often. At 25 years old, ​Betts had the season of a lifetime. He had a .346 batting average with 32 home runs and 80 RBI in 136 games en route to a World Series championship. Mookie Betts is the 2018 AL MVP! In 140 games this season, Trout hit .312 with 39 home runs and 79 RBI. While he was deserving of his third MVP award, it was Betts' year, and it would've been a travesty had he not won.